Polyversal players have access to Combatant Design Tools from Collins Epic Wargames that aid in the design of custom Combatant Tiles, the core Polyversal game component. If you're ready to get started designing Combatant Tiles for your own miniatures, please see below. Polyversal is all about customization. To help with the process of creating your own Combatant Tiles, we've included two Design Tools: The Combatant Design Spreadsheet (available now) and a web-based Combatant Design Application (coming soon). Begin with a miniature, an idea, and our Combatant Design Spreadsheet by Ken Whitehurst. Through many iterations, we're pleased to release the spreadsheet for personal, general Polyversal player use. There are two main tabs to work in- a Worksheet tab and the MasterList tab. The other tabs should remain locked and provide coded-in Design information from the Polyversal Rules. You'll need to pull up a copy of the rules (currently on Google Docs, available to Backers and Preorder customers only). Then, go to the Combatant Design section of the Rules and begin with Step 1. Walk through each of the Design Steps until you complete your design in the MasterList tab. Or, use the Worksheet tab to play around with different options. The spreadsheet automatically outputs Damage Tracks, Points Cost (Standard Psych Profile), and more, accomplishing most of the design calculations for you. 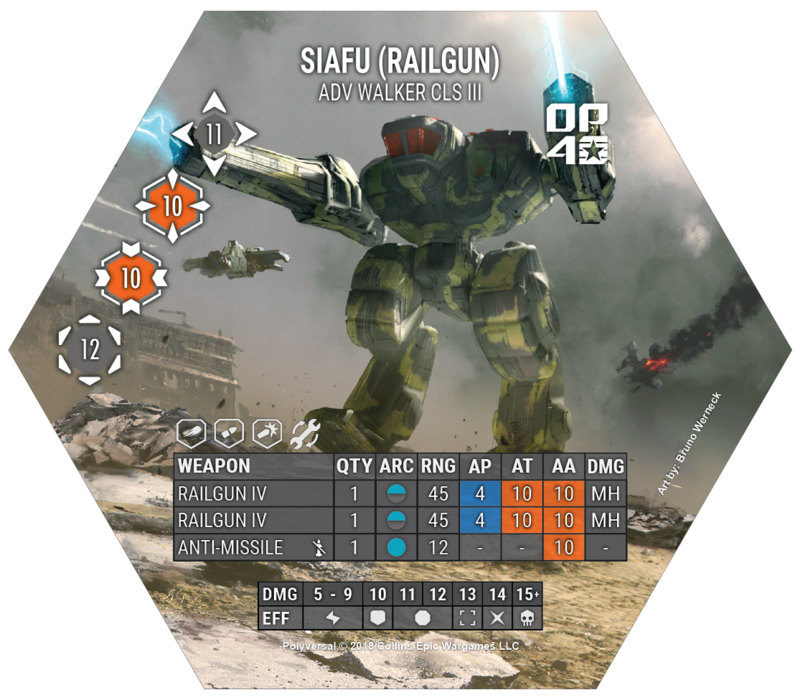 Coming Soon from Carl Olsen, this web-based application will make it easy to put your designs into a printable Combatant Tile format as shown in the Siafu Walker Tile above. The output template is designed to work perfectly with our custom peel-and-stick hexagonal photo paper. Please note: Use of the Polyversal Combatant Design tools is permitted for personal, non-commercial use only.